The GE (General Electric) C40-8 (Dash 8-40C, C40-8C, or simply Dash 8) is a type of six-axle, 4,000hp diesel-electric locomotive built from 1987 to 1992 with 585 built (the C40-8W having been subsequently built from 1989 to 1994; including over 800 C40-8W units, having 1,569 total). A typical UP (ex-CNW) C40-8. All of UP's acquired C40-8 units doubled the railroad's initial amount of 256, to 333. It is the predecessor to the B40-8; its four-axle counter-part, as well as being the first official member of GE's Dash 8 Series or locomotive line to not have been an experimental pre-production testbed like the C39-8 or the C32-8. Union Pacific (UP), the Chicago And Northwestern (CNW), Norfolk Southern (NS), CSX, Conrail (CR), and the ATSF (Santa Fe) were among the original customers to purchase units, while later customers such as BC Rail and Canadian National (CN) were among others who acquired specialty variants of the model (namely, the cowl-bodied C40-8M). Many are still in service on various US and other North American Class 1 railroads, though their numbers are currently dwindling, as portions of active rostered C40-8 units are currently in storage; most notably with BNSF and Union Pacific, to be used as spare units during traffic surges. Though, other units from both respective railroads have also since been retired or withdrawn from service for auction to leasing companies (such as NREX and GECX) for use on the second-hand locomotive market, and have since been sold to other companies like CN and Pan Am Railways. A typical ATSF "800 series" C40-8W built to their own unique specifications: having an angular, notched cab roof to meet clearance restrictions at York Canyon, NM. Said unit would then become BNSF 854.
as a result of the lower horsepower ratings. With increasing traffic levels and higher freight volumes, longer trains required more horsepower. However, to decrease operating ratios (thereby reducing operational costs, fuel costs, etc. ), the addition of three 4,000hp units meant that they could possibly replace five 3,000hp units (namely SD40-2s) on a day-to-day basis. However, with the additional feedback provided from the host railroad whom tested the Dash 8 testbeds, drastic improvements were made, and the C40-8 was born. Though, in an effort to push the sales of the C39-8, an "enhanced" variant was offered: the C39-8E, but the model didn't sell well and only generated a small order with Norfolk Southern. GE demonstrated such operational capabilities to the Burlington Northern, though they opted to test the three sole B32-8 testbeds until they placed a bid for a contract with LMX to construct a fleet of production B39-8 units for "Power By the Hour" lease service several years later. However, GE soon approached the company again during the C40-8W's reign of success, and encouraged them to replace their aging fleets of Dash 7 and SD40-2 fleets with said model, which by comparison, were deemed to be "outdated" when in relation to the CNW and UP's rapid transition with diesel technology (considering that the BN was once the flagship owner of the SD40-2; having amassed the largest fleet of the model than all the other Class 1 railroads, and was their main locomotive most favorable for any operation; especially with coal drags). Though BN declined the offer, and stuck with their initial Siemens/EMD SD60MAC/SD70MAC bid in 1992, which helped further improve and revolutionize diesel technology on the BN's Powder River Basin coal trains by becoming the leading industry standard. Today however, GE's Evolution Series locomotives are furthermore capable of replacing conventional DC-traction 3,000hp locomotives such as the SD40-2 in contrast to the C40-8, and offer even better advantages with their DPU, CTE, and PTC features implemented on Class 1 carriers. Hence, two ES44AC units are capable of replacing 5 SD40-2's in terms of tractive effort versus horsepower and technology. The C40-8 model offered a doppler-controlled wheelslip system (similar to what was offered with rival EMD's SD60), increased tractive effort, more even weight distribution (in contrast to its predecessors), updated engine specs, and updated traction motors, which furthermore resulted in a much smoother ride and better performance than with the aforementioned preceding models (apart from having improved design aesthetics). The model itself revolutionized today's modern motive power not only with its electronics, but by having a high-horsepower rating at 4,000hp; something that was previously never achieved for the domestic locomotive market, and the development of the "American Safety Cab" or "wide-cab" variant: the C40-8W. Thus, setting the new standard for average diesel locomotives as opposed to having a horsepower rating under 4,000hp and a common, conventional "standard" ('Spartan') cab like with the vast majority of other domestic American diesel locomotives built from 1963 to 1987 (excluding Canadian-built models having a wide-cab or cowl bodies in relation to American models like the F40PH , FP45, F45, and U30CG; but not including models like the DDA40X due to it being a specialty model). Railroads such as the Chicago And Northwestern (CNW) and the company that eventually acquired the railroad and all of its assets; Union Pacific (UP), were the two main customers who first purchased the original stock model. UP acquired their first fleet of 75 units to be utilized on their heavy and fast-paced intermodal and autorack services, while CNW acquired theirs for use on slow coal drag or coal train services in the Powder River Basin. Eastern-based companies such as CSX, Conrail, and Norfolk Southern placed orders for units later on, and were delivered prior to the arrival of CN's exclusive Canadian-built, cowl-bodied C40-8M in 1990. In an effort to increase safety while operating in harsh weather conditions, CN commissioned a custom-designed cowl body for their 55 C40-8M's. Built on Dofasco trucks from traded-in ALCO/MLW C630/M630 units, the Dash 8's were given a "Draper taper" design inspired by CN brainchild William L. Draper. Since the debut of the custom-designed 3,600hp MLW/Bombardier HR616's, CN units built with distinct cowl-bodies were given the notable notch to improve crew visibility without resorting to opening the cab-side windows in narrow clearances in tunnels or places with generally narrow clearances. BC and the QNSL also took delivery of C40-8M units from around 1993-1994, and were built to CN specifications. Domestic railroads also followed suit, for many wide-cab GE diesels built domestically from around 1991-onwards have a small notch on the conductor-side rear cab door; though the notch was originally intended to provide better clearance for the doorway rather than improving visibility. Such units; however, are in the process of being retired by CN, and are being replaced with second-hand C40-8 and C40-8W units from UP and BNSF, all of which were originally from CNW and ATSF ancestry. The QNSL units have since been retired. Two CN C40-8W units: one being a former BNSF (nee ATSF) H2-painted Dash 8, and the other being a former "Blue Devil" Conrail-painted Dash 8 under joint IC-GTW ownership. CSX purchased their first relatively-small fleet of Dash 8 units in 1989 and were painted in an exclusive variant of their "Stealth" scheme known as "Grey Ghost" (nicknamed by railfans and employees); having italicized numbering and lettering to help distinguish the once-unusual, unique, and highly uncommon (due to being completely new at the time) 4,000hp diesel locomotive model. Yet, CSX's Dash 8 fleet grew from having only 25 to over 70, and finally settled on dozens more standard-cab units along with a vast number of wide-cab C40-8W units (including 53 specialty C44-8W testbeds) increased the total before the split of Conrail between CSX and NS in 1999. Although Conrail only had 25 original C40-8 units, they had an abundant amount of wide-cab units; many of which were also built and delivered to LMSX before the 1999 split, but were eventually acquired under Conrail's "Shared Assets" plan by CSX and NS. Several years later, ex-Conrail B40-8 units owned by NS were leased and eventually acquired from their main rival. Thus, making CSX currently the largest owner for utilizing active Dash 8 units. Union Pacific; having a total of 256 units numbered in the 9100-9300 series, was among the largest (and first) customer to order the model, though the CNW merger of 1995 doubled the amount. Although the Dash 8 was outdated by the time production ended at Erie, the Dash 8's initial success further led to the development of the increasingly-successful and iconic C44-9W, or the "Dash 9", as production and development was well underway towards the end of the model's run between 1992 to 1994. Although orders were already underway with the succeeding model, between June and November 1994, Conrail 6230-6265 and Conrail/UP-assigned lease fleet units LMS (LMSX) 700-759 closed out production of the C40-8 family, which generated a grand total of 1,569 units. As of late-2016, CSX has since retired all of their standard-cab C40-8 (and subsequent four-axle B40-8 and "B20-8") units from their roster, and currently roster their remaining C40-8W wide-cab units originally ordered from 1989-1993 in active service. Pan Am has since required a number of ex- In 2017, the railroad retired all of their ex-Conrail units inherited from the 1999 merger. On another note, NS has since retired all of their standard-cab C40-8 units, and now only rosters their ex-CR C40-8W's and subsequent C40-8.5 rebuilds. CN currently possesses the most active Dash 8 units out of all Class 1 carriers, while UP and BNSF have more units in storage than in active service. Beginning mid-2013, NS rebuilt a number of their original (and ex-Conrail) standard-cab C40-8 units into what are dubbed as a "C40-8E", "C40-8.5W", or "C40-8.5" as part of a project to extend their longevity, provide better safety and comfort, along with featuring numerous enhancements and upgrades like their subsequent SD40E, GP59E and SD60E rebuilds. Among these changes were with the control system, the "brains" of the locomotive, in charge of an upgraded 7FDL-16 engine. NS also installed an electronic fuel injection system as well a newly designed "split-cooling" radiator system which separates the cooling system into two loops. One loop is meant for the jacket and bearing water while the other is for the intercoolers, which chills the air for combustion coming from the turbocharger. Notable upgrades to the operating environment inside the cab include an air-brake system upgraded to New York Air Brake's CCB-26, as well as including LEADER train-management software for braking. The multi-year program was intended to spawn at least 18 units per year once the program was under-way. NS 8501 and 8500 en-route to Altoona from Roanoke. 13 have been built total, but 11 have been completed. In early 2016, after spending several years of exhaustive tests at Roanoke and their main locomotive facility in Altoona, PA (Juniata Shops), they were finally towed back to Juniata one last time for completion. NS #8503 on the other-hand, originally received a C40-9W cab for comparison before it was renumbered to #8505. NS #8500 and #8503 were the last former Conrail-painted C40-8 units on the railroad's roster and retained their original liveries (albeit with a new "face") prior to completion. An obvious sign showing the proposed "C40-8.5" name is indicated with NS #8305's newer number: #8500; being the first of what's meant to be a new series of rebuilt Dash 8 units from NS. As of late 2016, the project has been cancelled in favor of the railroad acquiring newer AC-traction ET44AC units, for the rebuilds generated numerous problems with their electrical systems and were deemed "unfavorable" by locomotive mechanics and engineers. On another note, the DC-to-AC conversion standard-cab C40-9 units that have been undergoing conversion into "AC44C6Ms" have been proven to be the better rebuild option for the railroad. In July 2016, NS #8505 was wrecked in Chattanooga, TN, and has since been in storage undergoing overhaul with another unit, NS #8513. As of early 2018, 11 units are currently active, but 8 of said units are stored. Note: Unit #8503 (8505) wrecked and currently undergoing overhaul. UP #9430: a typical C41-8W. C40-8W - Wide-cab or "safety-cab" variant of the original model. C41-8 - Experimental, 4,135hp upgraded version; only three built and were owned by the CNW, yet eventually became a designation for units 8543-8574 for they were re-rated between 1991-1992. Though, no specific designation was given at the time. C41-8W - Experimental upgraded, wide-cab, 4,135hp gross-hp version of the C40-8W; owned by UP and ATSF, and was also part of a slight running change involving the front anti-climbers, cooling system, electronics, alternators, (and/or traction motors in some cases). C44-8W - Specially ordered by CSX with 53 examples built; all currently downgraded or de-rated to 4,000hp and classified as "C40-9W or C44-9W" due to having Dash 9 specifications (upgraded split-cooling system, dynamic brake grid, electronics, control systems, and updated traction motors). All numbered CSX #9000-9052. Note*: The CNW's final three C40-8's that were delivered in Spring 1992 were experimental upgraded 4,135hp units rated at gross horsepower delivered prior to the debut of the C44-9W (Dash 9) the following year in 1993. Said units were numbered 8575-8577, and were classified as a "C41-8" (not to be confused for its wide-cab counter-part ordered by the UP), yet eventually became a designation for units 8543-8574. Note*: Asterisk and bold lettering/numbering denotes C40-8W's rated at 4,125hp and are classified as a "C41-8W". Note*: Italicized lettering/numbering indicates Canadian cowl-bodied C40-8M units. Length 70' 8" 71' 8" 70' 8" 70' 8"
Since 2010, Union Pacific has been in the process of retiring their vast fleet of C40-8's, and have since been leased or sold to Norfolk Southern, CSX, and CN, as well as various different leasing companies such as HLCX, CEFX, NREX, CREX, and LLPX having several of the latter. Several CSX, CN, and UP C40-8 and C40-8W's have since undergone a radiator conversion to comply with the US EPA's strict "tier 2" standards (though, other emission levels or tiers have since become applicable). From a computer technicians stand-point, the electronics and microprocessor technology implemented on the C40-8 are often rougly compared to a Commodore 64; a revolutionary, yet long obsolete personal computer system. Hence, being one of the main reasons as to why railroads are retiring most of their C40-8's for long-haul, general revenue service and are replacing them with GEVO's. The ATSF's earlier fleets of C40-8W units (along with subsequent B40-8W units) originally had a different wheelbase diameter; measuring at 42 inches as opposed to 40 inches, and were rated at 3,800hp upon the railroad's request as opposed to what the model designation originally gave it. Several years shy of the Conrail Split of 1999, units to LMX (or LMSX leasing) which were eventually purchased by the Illinois Central (IC) and Grand Trunk Western subsidiary of CN (GTW) shortly before the IC was purchased by the CN, as well as CSX and NS purchasing several units before the Conrail split officially occurred in 1999. Because of how different the interior design and layout for the C40-8W's cab is, the desktop controls are placed significantly differently than other wide-cab GE models (minus most modern-day GEVO's, which have more traditional or conventional controls similar to the original C40-8). The C41-8W originally had its own unique type of trucks (similar to export models), which were often used on several C40-8's. Before NS began their "E" rebuilding program (sometime in 2010-2011), numerous UP C40-8 units were leased to the railroad before eventually being turned over to various leasing companies (like CREX and NREX). Many former Conrail Dash 8's owned by CSX still retain their original marker lights. During the economic downturn (Great Recession) of 2008, many of UP's standard-cab Dash 8's were placed in storage before ultimately becoming retired and auctioned to CN and numerous leasing companies. UP 9400 was the 1,000th Dash 8 unit built in 1993, and has been rotating in and out of storage for several years. UP 9405 was also dedicated with a safety record by having a special plaque applied to the side of the cab similar to UP 9700. CN 2122 (formally UP 9087 and originally CNW 8575) is one of the original three former CNW 4,135hp C41-8 experimental testbed units which survived, as well as having once been one of the last CNW-painted Dash 8 units left on UP's roster (the unit was also one of the only unpatched CNW Dash 8 units before eventually receiving patchwork in 2005-2006) before becoming one of the many ex-UP (exx-CNW) Dash 8's purchased by CN as a result of an auction. The unit has since been converted or reconfigured to the standard 4,000hp output since CN's purchase. CN #2113 (ex-UP 9078, nee CNW 8566) was painted with a special banner commemorating the CN's 15th anniversary of independence from the Canadian government in 2010. CN 2124 (ex-UP 9089, nee CNW 8577) also retains said commemorate banner, but was also originally the exclusive CNW Dash 8 unit painted with a unique "Safety" banner which unfortunately became faded not too long before the CNW merger in 1995, and tagged with graffiti prior to the unit's auction to CN. CN 2115, 2107, and 2128 also retain said banners as well. The C44-8W originally had a few minor differences between every other variant of the C40-8W; the most notable difference being the frame steps. The CREX Leasing Corp. (as with NREX and numerous other leasing companies) currently owns several fleets of former UP C40-8 units; most which originate from CNW ancestry. Conrail briefly experimented with using DPU technology on their C40-8W units around 1995-1996, yet the experiment was unsuccessful. CNW also experimented with said technology as well. Ironically, CSX has recently replaced the majority of K5LA and K5H (including their subsequent variants) horns in favor of their early 1st generation GEVO (ES44DC) units horns (being the 1st generation K5HL). Hence, the units having their horns swapped for one another. 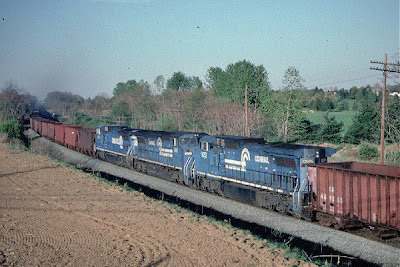 Most CN railfans often nickname the railroad's fleet of former Conrail-painted C40-8W units as "Blue Devils", while the ex-BNSF/ATSF C40-8W units were often nicknamed "Canadian Pumpkins" or "Falsebonnets". Years prior to the UP's acquisition of the CNW in 1995, the railroad (CNW) experimented with DPU technology on a handful of their C40-8 units (including their three C41-8 units) shortly before the debut of the Dash 9 and AC4400CW in 1993-1994. As of mid-2013, several C40-8 units on CSX's roster have been repainted into the company's YN3b scheme. CSX #7562 is a prime example: being a former YN2-painted unit which began life as one of the earlier Dash 8 units which originally wore the "grey ghost" Stealth scheme. During the 1992 presidential campaign, former U.S President George H.W Bush began what was known as a "whistle-stop" campaign, which involved traveling cross-country by rail (from CSX to UP/East Coast to West Coast) to compete against candidate (and later 42nd President) Bill Clinton. To commemorate and celebrate this event, CSX specially painted C40-8W #7812 with an exclusive scheme representing the 1992 election. Ironically, the unit retained said scheme long after the campaign and election ended, and didn't receive a new coat of paint until several years later. CR #6192 was involved in a wreck which destroyed most of the cab. However, the unit was salvaged and repaired at NS' Roanoke, VA facility and was fitted with a C40-9W's cab (having high-mounted numberboards) sometime during the mid-1990's. The unit became CSX #7357 as a result of the Conrail split in 1999. CR #6259 (a C40-8W) was involved in the same wreck which destroyed most of the cab. However, the unit was salvaged and repaired at NS' Roanoke, VA facility and was fitted with a C40-9W's cab (having high-mounted numberboards) sometime during the mid-1990's. The unit (ironically) became NS #8436 as a result of the Conrail split. Few UP C40-8W/C41-8W units have since been retrofitted with ATS (Automatic Train Stop) capabilities and features for operating local service in the Chicagoland area, where block signals are very strict and are known to suddenly change in regards to dense traffic. Several ex-UP C40-8's and BCOL C40-8M's have since been assigned to DPU service on CN, and have retrofitted radio equipment to perform said action. A BC Rail (British Columbia Railway) C40-8M, revealing its distinct cowl body. Notice how the trucks are significantly different than other models; they are actually "Dofasco" trucks rather than GE's more common "Adirondack" truck model or style. A CN (ex-BNSF, nee ATSF) C40-8W. A CSX YN2-painted C40-8W with a former Conrail-painted C40-8W. A UP C40-8 with an unusual leading truck (along with other spotting features labeled). An odd CSX Dash 8 with missing lettering. A CSX "Grey Ghost" Dash 8. A patched YN1 CSX "Grey Ghost" Dash 8. UP #9400 with its special banner; being the "1,000th" Dash 8 built. CN #2122 during the purchase. CNW 8575 shortly before becoming UP 9087. CSX #9000; the first of 52 C44-8W units exclusively ordered by CSX. CSX #9000 showing proof of its conversion (the frame being the most noticable difference from the previous images). NS 8305 (now NS 8503) as seen in the NS Roanoke, Virginia Shops. A typical former UP C40-8 with CREX patchwork as-seen filling a power shortage on CSX. Two CSX C44-8W units meeting a NS "hi-hood" unit in Cincinnati, Ohio sometime before the two units were eventually converted. CN #2113; the CN 15th anniversary independence unit. A close-up of CN #2113's banner. Another example of a C40-8 undergoing an overhaul into a "C40-8.5" (the unit being former NS #8306; now #8505). NS #8500 undergoing a load test for its engine or prime mover. One of the several UP C40-8 units leased to NS before NS established their "Eco" rebuilding programs. CSX #7562: one of the only C40-8 units to retain CSX's "YN3b" scheme thus far. The current status of C40-8 (and SD60M) units as seen in the UP's Alfalfa Yard in El Paso, TX. CSX #7357; one of the wrecked ex-Conrail C40-8W units which became salvaged and was fitted with an NS C40-9W cab. CSX 7357 when it was originally known as Conrail 6192. A detailed view of an (ex-Conrail) NS C40-8W's cab interior, revealing the noticably different desktop control stand on the engineer's side (although vaguely similar to a Dash 9's control stand). A CN C40-8M cab interior. CSX #7812 during the 1992 presidential election campaign. CSX #7812 long after the election and campaign. CSX 7812 as of today. CNW #8577 long before becoming UP #9089. An up-close view of CNW #8577's banner. UP #9089 prior to its auction to CN. UP 9089 revealing its removed cab numberboards as well as its faded decal. CN #2124 revealing its distinct grilles mounted above its cooling section or radiator fins/wings. CN 2124 revealing a 15th anniversary banner similar to CN 2113, only placed on one side of the unit. An ex-BNSF C40-8W painted in the H3 ("Heritage 3") scheme, which is often considerably rare. A consist of ex-UP C40-8 units en-route on a typical CN manifest train heading towards Centralia, IL. CN #2005: one of the recently acquired ex-CREX (originally UP, nee CNW) C40-8 units now under CN ownership. Another view of the storage fleet in El Paso. The two NS C40-8.5 testbeds as seen in Roanoke, VA.
Another view of NS 8500. An up-close detailed view of a C40-8M's Dofasco truck. NS #8501 revealing the more distinct "RLS" (or "Phase 2") variant of the railroad's unique "Crescent Cab". The two main C40-8.5 testbeds heading for Altoona, PA from Roanoke, VA to be completed and tested for emissions, defects, and other performance traits. A YN3b painted CSX C44-8W. NS #8501 as of today. NS #8505 (formally #8503 during the earlier stages of development) being towed on a train in Pennsylvania. NS #8504 (far left of the consist) sitting at Norfolk Southern's Roanoke, VA shops. A pair of brand-new CSX "Grey Ghost" C40-8 units in 1989. NS #8311 prior to when it was wrecked and eventually rebuilt. NS 8311 awaiting overhaul at Altoona. The first stages of repairs for the unit. NS 8311 prior to its conversion into a C40-8.5 or C40-8E. NS #8505 revealing its distinct redesigned radiator cooling system and conventional GE wide-cab. CN #2458: a repainted ex-LMSX (IC/GTW) "Blue Devil" C40-8W. UP #9512 showing its evidenced "C41-8W" designation. Although no designation was given to the units rated at 4,135hp by GE, UP and ATSF began designating later batches of units delivered under the "C41-8W" name. Pan Am (MEC) #7552 (ex-CSX) C40-8 leading an officer car special (OCS) train. Ex-NS C40-8 and ex-CSX B40-8 wearing new GECX decals. A CN C40-8 serving as a DPU on an intermodal train.